Created specifically for the EBSQ show "Dia de los Muertos". The "Day of the Dead" celebration differs somewhat by region, but in many areas, it is a two day celebration. On the first day, ancestors who died as children are celebrated and remembered. The next day, the festivities are directed towards the adult ancestors. 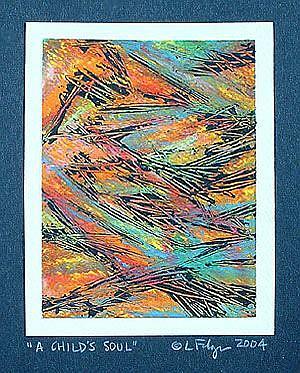 This abstract work is my interpretation of the bright and happy soul of a child... any child... the littlest angels.